Styria: spa holidays, ski holidays, hiking holidays in Austria. 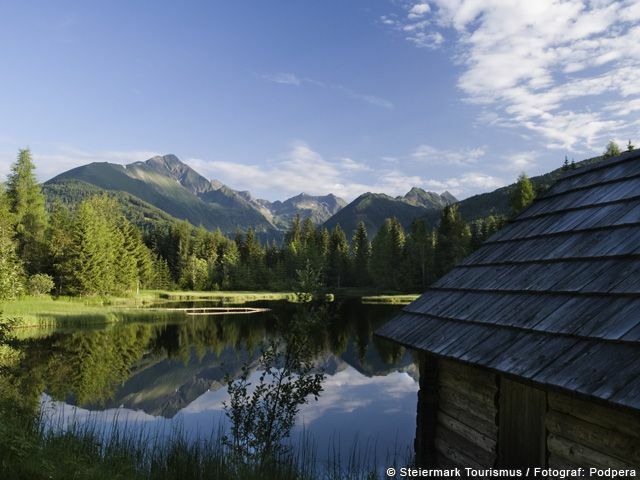 Holidays in Styria are synonymous with nature, relaxation and friendliness. With its great mountains and rolling pasturelands, seven nature parks and one national park, Styria lends itself to great hiking holidays. Styria also boasts 9 thermal spas, including the Hundertwasser-Therme Bad Blumau and the Therme Loipersdorf, making it a top destination for wellness aficionados. The capital city Graz has a friendly and lively atmosphere. Worthwhile sights include the Grazer Uhrturm clock tower, the Kunsthaus and the Murinsel. Snow-covered landscapes, invigorating mountain air, stunning views, crackling fires in quaint cottages – so all this and much more is winter in Styria. Styria’s seven nature parks offer great snowshoeing, Nordic skiing, skating, curling and skiing, and make an ideal destination for winter holidays with your family. Schladming, annual host of the downhill ski world cup, boasts kilometers and kilometers of groomed ski slopes, while snowboarders will get their money’s worth on Kreischberg. Whether you are looking for a hotel, guesthouse or apartment for your holidays in Styria – chances are Tiscover has it for you. Styria makes a truly unique holiday paradise throughout the year! The entire province is of awesome natural beauty – majestic mountains, crystal clear lakes, healing springs, gently rolling vineyards, healthy air and genuine Styrian hospitality await you here. Choose from a great variety of cozy accommodations, ranging from campsites and hotels to lovely private guesthouses. Winter is in the air! Snow-covered winter forests, glittering powder stashes, quaint mountain huts and funny tobogganing adventures. Dachstein, Hochschwab and other ski areas promise unlimited adventures, activities and winter fun. Crisp and clean air, picturesque landscapes, entertaining programs and plenty of winter highlights await you. A truly memorable paradise for holiday makers who prefer a vacation at a more leisurely pace. Relax, unwind, restore your energies at the countless thermal spa centers embedded in Styria's gently rolling hills. Graz also makes a wonderful destination for city cruisers.